Everyone must go to New York at least once in their life. 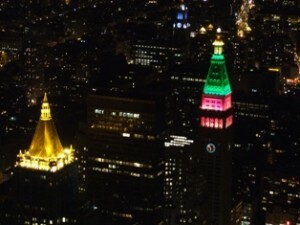 There are only two cities in the world that have a true, big-city pulse; London is one and New York is the other. They roar with urgency, power and wealth. I was impressed with NY. A friend of mine said New York was in America, but it wasn’t an American city – it was just New York. 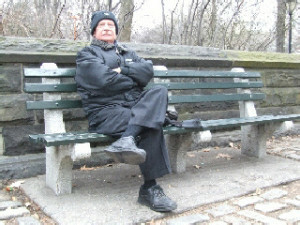 New Yorkers (those we met in Manhattan, anyway) are very like Londoners – they sit quietly on the underground trains, somewhat guarded in their responses, enveloped in their little bubble, reading their paper, listening to their iPod, but they will have a short chat with you if you want to know the best way to get to somewhere in the city. They are polite, kind and will help if you ask. We were living in the Tatham, a little hotel on the corner of 5th Ave and E28th, so Madison Ave (the corner right) was a very short walk away, as was Park Ave, the Empire State Building, and Broadway. This lady pushing a pram was swept up by underground steam, which is generated by huge gas-fired stations deep under New York. 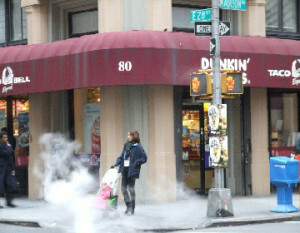 Since the 1880s the steam has been sold to heat Manhattan buildings. 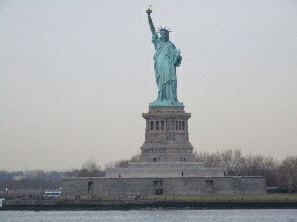 Our first day in New York was grey and cold, so we took a trip on the Staten Island Ferry from deep Downtown Manhattan. I was amused at the Subway – all trains go either Uptown or Downtown. Once you get the hang of it, underground travel is easy. The Staten Island Ferry is free and you go close to the Statue of Liberty. Did you know it stands on a gun platform? The holes in the base were where the gun muzzles stuck out. The second day was sunny so we walked. 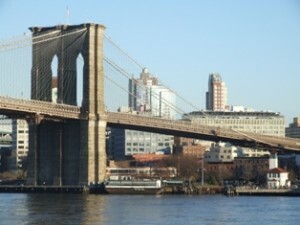 On the left is our view of Brooklyn Bridge from Pier 17 with a really cool view of autumnal New York in the background. 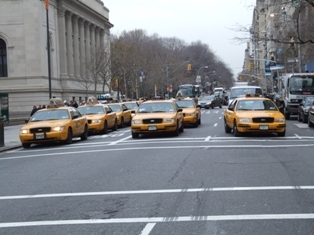 I took the picture of the massed taxis from the middle of the road outside the Metropolitan Museum of Art, while the lights were red. Traffic in New York is dominated by taxis, which honk their horns at every opportunity, and race at 40mph up and down the wide avenues, many of which are one-way streets. In spite of their mad-dash habits, they were polite to pedestrians and waited quietly while we crossed. If a picture tells a thousand words, then here are 4000 of them. 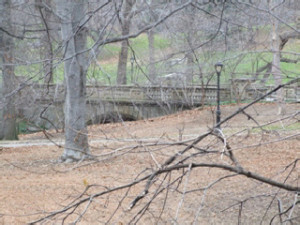 They are all of Central Park. 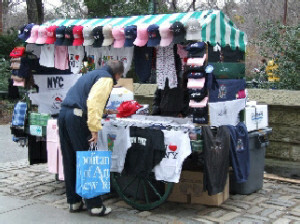 and of course you have to browse a bit in the Central Park souvenir kiosk. Anyone want a New York Nicks cap? 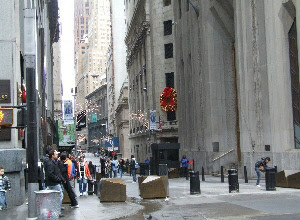 I’ve worked in banks, I had a short stint supporting Bloomberg and I have worked in London City for most of eight years, so the one place I wanted to see in New York was Wall St. I was amazed at how small it is! No more than a lane, with tall sides. As you can see, it’s been pedestrianised – and the cars are kept out with those very solid bronze rocks. It was not very busy because the day was a weekend, and The City is almost deserted then, too. Somehow, though, the magic of the name would not leave me and I had to stand and breathe the atmosphere…. 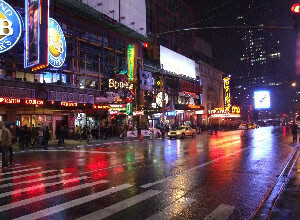 This is Broadway in the rain. 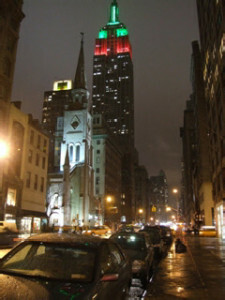 The bright lights are those of the Empire Theatre and the Hilton @ Times Square. We give ourselves fancy names now we are in the Computer Age. Not far from here are the famous theatres. Broadway is different from other Manhattan north/south or east/west streets because Broadway carves a swathe diagonally across Manhattan, on the map from top left to bottom right. The Disney Centre is a series of large halls used mostly for exhibition space and conferences. When the building first went up, it was highly polished and stories are that some people in some offices in the city were blinded by the reflected light from the Disney Centre at certain times of the day and certain days of the year. There are a few surfaces with the original polish surviving, but they are out of the sun all year. Our impression of LA is that it’s mostly a slum. On the way from the airport to the city centre, everything you can see is part of a slum; 250,000 homeless roam the streets of the greater city. In one of the wealthiest cities of the world, they still have overhead wires. A is probably the graffiti capital of the world. 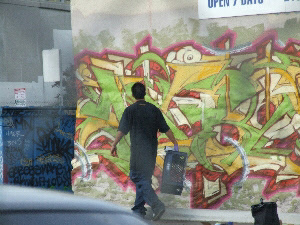 This graffic artist was working with a small gang on a wall near Chinatown, close to the Downtown area. You can see the criss-cross of the chain fence through which I took the photo. 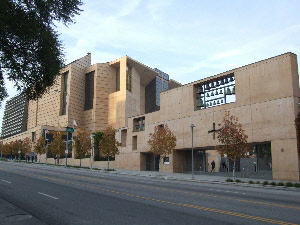 The Cathedral of Los Angeles is worth a visit. It’s unique, not overly self-consciously modernist, and does not participate in the gaudy Spanish Catholic traditions of the people who mostly attend it; inside, the building is austere, minimalist, even. There are no gory statues such as you see in Spain and very little ornamentation. It had a beautiful front yard and cafe, with a quirky garden of olive trees and statues of carp, camels and beehives. 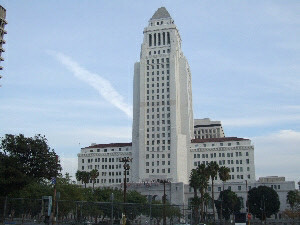 This is Los Angeles’ iconic building, City Hall. You can see graphics in header pages and signposts all over the city, using the pyramid shape at the top of the building to show where Downtown was, or to indicate an official communication from the council or the mayor’s office. 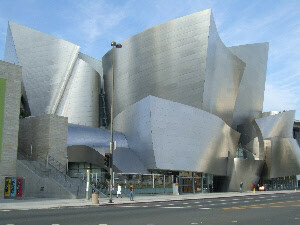 From some views, Los Angeles is a city of wealth, super-modern buildings and wonderful promise. 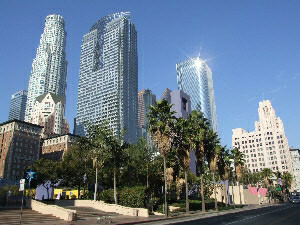 This photo is looking across Pershing Square to Downtown, the centre of the city. 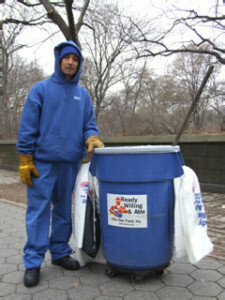 The Downtown newspaper said that 90,000 homeless eke a poor living from the miserable streets of Downtown. They are constantly rummaging in rubbish bins and they take the aluminium cans they find there to recycling machines where they get paid in small coin for each can they shove in. 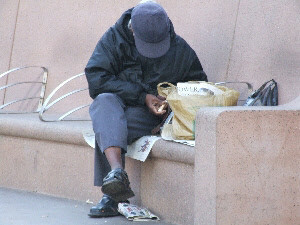 This chap was sorting his belongings in Pershing Square, Downtown, where he could hear the waterfall but exposed himself to the close scrutiny of a street security guard. 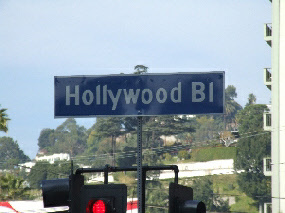 I have put two really famous names for you right at the beginning of this section – Hollywood Boulevard and the Hollywood sign in the Hollywood Hills. The sign itself used to advertise property for sale in Hollywoodland, but the sign fell into disuse and the “land” part of the sign was lost. Our own Alice Cooper became heavily involved in saving the sign and he bought the H and renovated it. The entire sign is now in 40ft high corrugated steel sheets (such as you would use on your roof) and is designated a national monument. We took a bus tour of Los Angeles because we were only there for two days and LA is a huge, sprawling city that is too spread out to walk around. 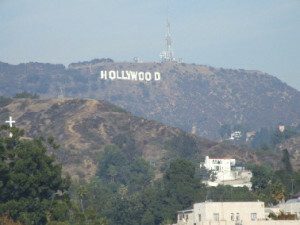 Part of the bus tour was to Hollywood, so we parked the bus close to Hollywood Bvd and had a quick look around. We saw the Roosevelt Hotel where Marilyn Monroe used to live and was the site of the first Academy Awards in 1911 and we also had a look at the Chinese Theatre. It’s not a theatre at all, it’s a cinema and it’s not Chinese, either, it’s a building that represents what Sid Grauman in 1927 thought a Chinese building should look like. Never mind, it’s pretty spectacular, even a bit over the top. Near it is the Kodak Theatre where the Academy Awards will be held for the next 50 years or so. I thought the whole street was a bit unkempt and down at heel so I asked why; in the 1980s, due to horrible bad management, Hollywood went bankrupt and I think it still is. There are more than 2000 five-pointed stars like this in the footpath along both sides of Hollywood Bvd, all the way down to Vine St. Remember the Elvis song about a cop breaking his little bottle of Love Potion Number 9? 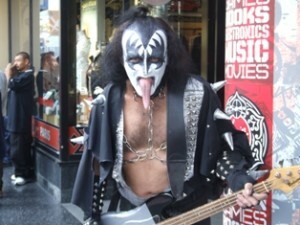 This is where it happened… The locals call this strip the Walk of Fame. 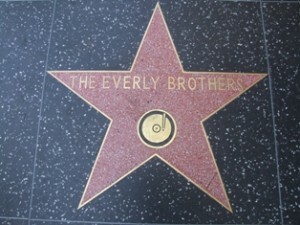 I grew up with the Everly Brothers being played on the radio when I was at primary school, so that’s why I captured their star. The symbol of a record player indicates they received their award for music. The Walk honours celebrities who have been nominated by the Hollywood Chamber of Commerce. They are not necessarily movie stars – Donald Trump is there – but they are all active in the entertainment industry. The person nominated has to pay $15000 towards the costs of the star and its installation, but usually the fee is actually paid by the nominee’s fan club, movie producer, TV network or recording studio. 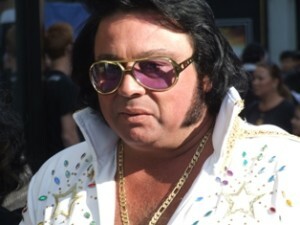 I looked for the impersonators along Hollywood Bvd and there were plenty of them – a Michael Jackson, a Jimi Hendrix, a Darth Vader, Kiss, and this petulant Fat Elvis. 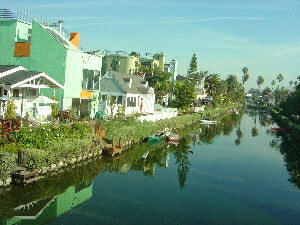 The little house in the left middle ground on the canal in Venice, LA, is owned and let by Julia Roberts. The driver said, “The stars are everywhere. If you meet a celebrity, greet them like a normal person, because they are just normal people like you and me, and they will be quite pleased for you to take their photograph and ask for their autograph.” I didn’t get to test his advice, because I didn’t see a celeb anywhere. The name Los Angeles refers to a whole district, as well as a single city. 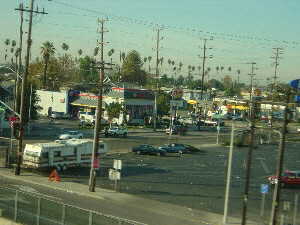 Within the district there are several large self-contained cities, like Hollywood, and here. This is the Marina Del Ray, of the city of Del Ray. This is the only photograph I had to take from inside the bus. There are thousands of boats here, many on land for seasonal repairs. 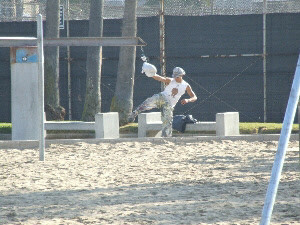 This is Venice Beach, the Baywatch set. Of course, there are no red bikini-clad life savers, because the guards already save enough lives without the distraction of pseudo-drowners trying to get some female attention. It seems the life-savers are necessary because the water is surprisingly cold. Those who swim without a wetsuit can suddenly find themselves shivering uncontrollably and therefore unable to swim. In summer, there are up to 600 rescues a week. 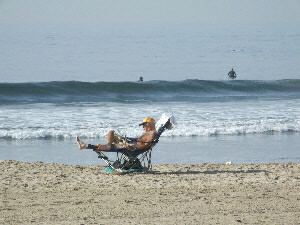 There is a 100m strip of Venice beach that for some reason attracts the athletes, or perhaps men who like to show off their naked upper bodies, to people who like to look at that sort of thing. Anyway, this length of sand is called Muscle Beach. Perhaps because it was New Years Eve the place was almost deserted, but the only action I could find apart from the handball and an indolent game of basketball was this chap carefully, slowly and rhythmically practising his kickboxing moves. The minibus driver insisted on taking us to Farmers Market. I couldn’t tell you where in LA it was, and when we got there I wasn’t too impressed with it. A lot of people mulling over a lot of stuff you wouldn’t take home. We found some nachos and cheese for lunch and strolled along an ex-tramway street. 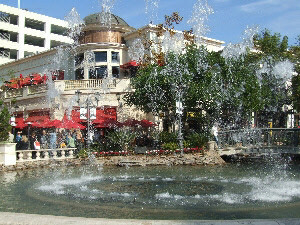 At the end was this nice little spot – The Grove. A hump-backed bridge spanned a pond in the middle of which was this fountain, playing with a musical background. You can see the water shoots suspended in mid-air on one of the more active chords of the piece. 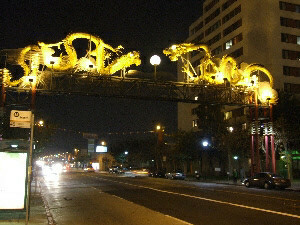 It’s always an adventure to go to Chinatown, even though most of them are like all the others. This one in LA had a vociferous jewellery centre that caught Elaine’s attention as the bamboo sellers jostled with the little food bars. The nice thing about all Chinatowns is that the traffic always has to go slowly and make its way carefully amongst the crowds who mill along the footpaths and casually cross the narrow streets. Both of us admired this magnificent gate to the quarter. It was only a short walk from our hotel in the Downtown area, and in a city where walking is difficult because of the distances, this was really pleasant. It was also the end of the mini-bus tour. Hawaii is a tropical island in the middle of the Pacific, north of the Equator. We went there just in time for Christmas. Winter in London, summer in Honolulu – not a bad choice. The picture on the right is the view of Honolulu from our hotel, the Polo, 9th floor. We could wear t-shirts and sandals and of course the rain is warm. What you notice particularly about Hawaii is the quality of the light. Look at how clear the buildings are, how vibrant the colours. This is not paradise because the people are wealthy, they’re not; this is paradise because the sun shines brightly, the sea is deeply blue and the evenings are fragrantly warm. 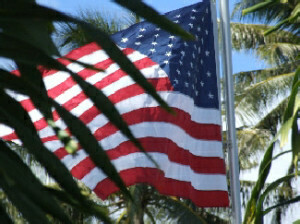 Honolulu is on O’ahu, which is in the middle of the island group, and it’s all very American. Near our Christmas dinner house, this huge Old Glory waved in the front yard of a near neighbour and another had a small flag growing with his pot plants as part of his letterbox, as you can see in the photo below. We sun-bathed on low recliners, wore sun-glasses and ate ice-cream. O’ahu is an island full of flowers – beautiful, big showy hibiscus like the one you can see right, with bright bougainvillaea and a huge variety of orchids. The wonderful display you can see on the latticework around the front gate of another neighbour in the picture, below, was quite common. A cheery little native dove cooed in a unique singsong and picked titbits from the cracks in the footpath. Colourful birds I had never seen before sang songs I had never heard before. Look at the colours in this picture – aren’t they terrific? The clarity and brightness are remarkable. 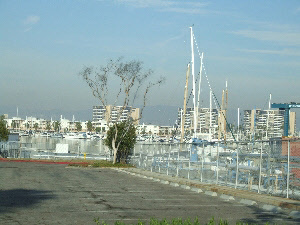 This is the marina close to our hotel. The funny thing is that we humans take ourselves with us wherever we go. 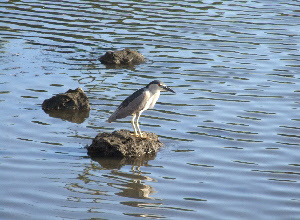 Look at the rubbish on the surface of the water. Who would do that in paradise? 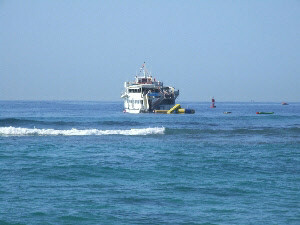 You moor your million-dollar yacht on a silent, silver pond, admire the view – and then chuck your junk overboard. It did not smell nearly as lovely as it looked. Some of the views in Honolulu are just stunning. 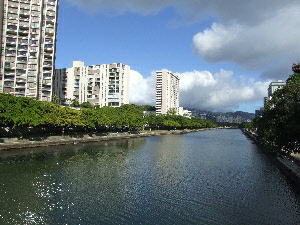 An offshoot of the marina is this canal development. I am standing on a low bridge just a couple of hundred metres from our hotel and this canal, fish and all, stretches away almost to the foothills. I’m not sure how the water is circulated, but this is a sea-water canal. The main reason for going to Hawaii was for the wedding of very good friends. This wedding was to take place at dusk on Magic Island, Hawaii. It’s not an island at all, it’s a spit of land with a park, a pond and a banyon tree. Fortunately for us, it was close to our hotel. Close enough so that Elaine was emboldened to think she could walk there in her silver sandals and glittering ball dress. The hotel staff commented to us the following day that they watched her walk all the way there and thought she was very brave! You can see here just how lovely the location was for a wedding; palm trees, a gentle, warm breeze, the rolling surf and excellent company. 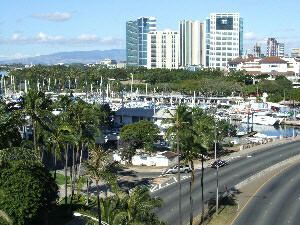 Honolulu is, of course, a modern, multicultural city. Read Hawaii, by James Mitchner, to get a flavour of the sometimes turbulent history of the natives, the Chinese, the Japanese and the Americans. 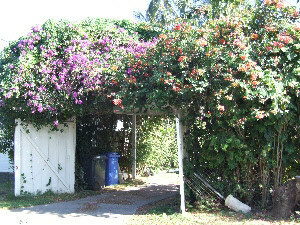 We took a short trip around the bays in the south of O’ahu and saw some of the shanty villages the natives live in. 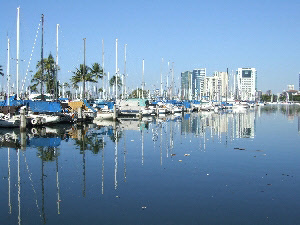 These conditions point to the probability that the wealth being generated by Honolulu and Waikiki is not doing a lot for the local economy. Most of the money must be being repatriated to the mainland. Pity. 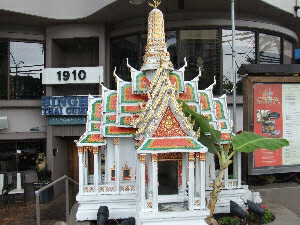 This little shrine was outside a restaurant. This is the essence of paradise, isn’t it? A young chap sits on a log next to his girlfriend, and they sit and look at a warm, sunlit, idyllic scene. 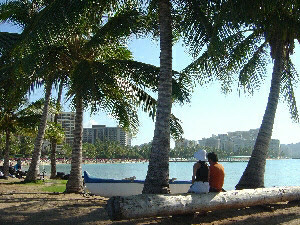 They are looking across the Magic Island pond to Waikiki. Every day, this ship quietly and slowly sidles up to this spot and drops anchor. It lets down huge orange pillows and people climb down off the ship and go swimming, fishing and surfing. I’ve never seen anything like it. Hawaii is a wonderful place to have a wedding. This couple and their chaperone (?) 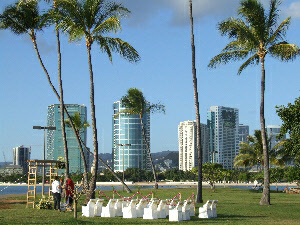 were married at the Hilton Hawaii Village, a 2000-bed hotel. One of five similar hotels in Waikiki. On the Magic Island foreshore that faces Waikiki (so there is a nice background in every photo) we saw four weddings taking place at the same time. 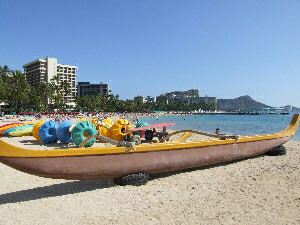 These are the racing catamarans of Waikiki, drawn up on the beach. There is quite a culture of sport amongst the young in Waikiki. The catamarans are paddled by a crew of 5 – very quickly – even though the canoes are quite heavy for the crew to lift out of the water.